Place chicken drummettes in a large container or bowl. Mix all ingredients for marinade, and pour over chicken. Marinate the chicken for 30 minutes. In a saucepan, mix the first seven ingredients for the sauce and bring to a boil. Combine the cornstarch and water, and drizzle into hot sauce. Simmer until slightly thick, and turn off heat. Heat the oil for deep-frying to between 360° and 375°F. Remove chicken from marinade and lightly coat with cornstarch. Place chicken into fryer or wok, and deep fry for about 5 minutes or until chicken is golden brown and cooked through. Remove chicken from oil and drain either on a towel, or in the basket. Place drained chicken and sauce into a large bowl and toss to coat. 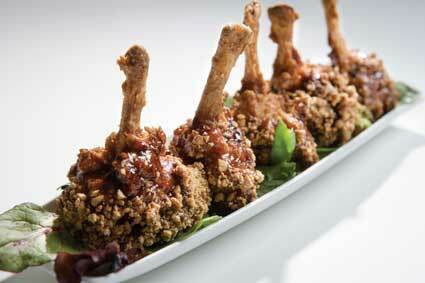 Place chicken lollipops on a platter and garnish with ground peanuts and scallions.